We must never forget. The significance of our Maveerarkal and Kaarthikai Poo. The month of Karthaikai, November, marks great significance for us Eelam Tamils around the globe. November is a month dedicated to commemorating our Maveerarkal, and their selfless sacrifices for our nation. Many Tamil Student Associations at various universities and colleges work in organizing numerous programs that seek to educate peers of the sacrifices of our Maveerarkal, and to commemorate them. Through musicals, dramas, speeches, poetry readings and alternative campaigns, Canadian Tamil youth accept their responsibility of educating and respecting the tremendous sacrifices of our Maveerarkal. Every year, partaking in such events, brings me a sense of peace, hope and strength. Every year without fail, through such events, I am reminded again, of the humble, and selfless sacrifices of our brothers and sisters, and realize their undeniable love for our Motherland, Tamileelam. This month, the Kaarthikai Poo, is also worn proudly by many. The Kaarthikai Poo was designated as the Tamil Eelam National Flower in 2003. The Kaarthikai Poo contains the spectrum of colours of the Tamileelam National Flag – Red, and Yellow. Furthermore, in the month of November, this flower blooms throughout the Tamil homeland, in the north and the east. 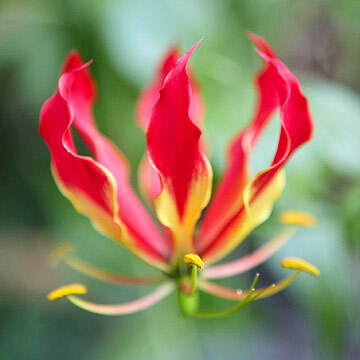 In English, the Karthikai Poo is known as the ‘Glorisa Lily’, or alternatively as the Flame Lily. Some of the properties of the flower itself are quite remarkable and inspirational. Unlike other flowers that quickly wither when cut and placed in flower within a few days, the Karthikai Poo can survive and endure for up to four weeks when cut and placed in water. But, what is most astounding of this flower, is that it symbolizes regeneration and rebirth. Once the flower has bloomed once, the growth tip of the bulb of the flower actually grows another fork tuber, producing another bulb, and another flower. The Kaarthikai Poo, in its properties, produces two other bulbs, and thus two new flowers from its seed. So from each flower, comes two new flowers. A powerful analogy can be drawn from this property to our Maveerarkal, who become seeds of revolution and hope in their passing, and thus, using the Kaarthikai Poo as a symbol, is truly powerful. Assigning specific flowers as state flowers, or national flowers is a tradition that has been practiced for many centuries, the assigning of flowers to symbolic significance began with the assigning of specific deities specific flowers. This tradition is carried out today, where nations, and states continue to assign flowers of significance to commemorate specific occasions, or to particular nations. This month especially, we must all come together at these events, and show our respect for our Maveerarkal, and we must all wear the Kaarthikai Poo proudly. If your school is organizing an event, go to it, show support and respect for our heroes. We must all educate our peers, and co-workers of their significance, and most of all, we must remember. They gave up their lives so we could be free, and we must never forget them, but instead, move their dreams forward. “Bulbs and Summer Flowering: Gloriosa Lily.” Garden Express. 2011. Retrieved from http://www.gardenexpress.com.au/gloriosa-lily/. November 01, 2011. This entry was posted on Saturday, November 8th, 2014 at 10:08 pm	and is filed under Uncategorized. You can follow any responses to this entry through the RSS 2.0 feed. You can leave a response, or trackback from your own site.